The Episealer implant from Episurf is a custom-made focal resurfacing implant designed to treat focal articular cartilage defects in the knee. The implant is designed from high-res MRI images of your knee, to exactly match the size, shape and contours of a cartilage defect. 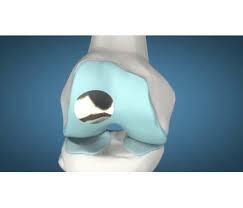 The implant is metal and is press-fit, and is relatively easy to implant into a knee. 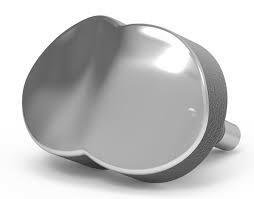 It allows very early weight-bearing post-op, and rapid rehab. It is ideal for older patients who might not be ideal candidates for a biological reconstruction (with articular cartilage grafting) but who have a small area of focal damage that is not bad enough to justify partial or total knee replacement surgery. Short-term (2-year) outcomes are highly encouraging, but (as with any new technology) longer-term (5-year or 10-year) results are not yet available. The Episealer implant from Episurf is like a mini custom-made partial knee replacement, designed to treat small isolated focal cartilage defects in patients not suitable for articular cartilage grafting procedures, such as ACI or Chondrotissue grafting. The ‘biological’ options (i.e. cartilage grafting) are appropriate for younger patients, who can cope with the very slow and restrictive post-op rehab that’s required after the surgery, and who are prepared to accept a success rate in the region of about 80%. ‘Young’ is an arbitrary term, but generally, if a patient is younger than 35 then the surgeon should sway towards ‘biological’ procedures. If a patient is over 50, then ‘replacement’ rather than ‘reconstruction’ becomes more acceptable and more appropriate. The difficulty arises in the grey zone (pardon the terrible pun!) between the ages of 35 and 50, where decisions are more tricky and where the physiological age of the patient (as opposed to just their chronological age) becomes an even more important factor than normal; and here, careful considered judgement has to be employed on a case-by-case basis. With the Episealer, the area of articular cartilage loss in the knee is carefully assessed using a special high-res MRI scan that is sent to the design engineers at Episealer. 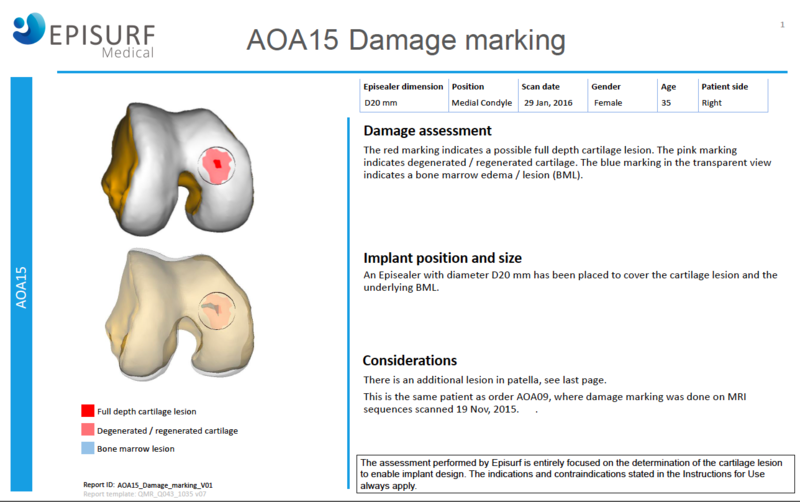 They then assess the technical details of the case, with respect to whether the defect is suitable for an Episealer implant, and if so, then they design an implant that matches the size, shape and contours of the area that needs treating on the surface of the patient’s knee. The Episealer team then produce a patient-specific implant, and this whole process (from scan to surgery) tends to take about 6 weeks or so. The Episealer is a metal implant, with a highly-polished titanium surface and with a peg that fixes the implant into the bone. The peg is covered with hydroxapetite, and the patient’s bone grows onto this, so that no bone cement is required. The Episealer is implanted through mini-open surgery using special patient-specific guides, and the implant is press-fit and fits perfectly, which means that it is solid and stable right from the word go, which allows for early rapid mobilisation and rehab. The Episealer was designed in Sweden by Professor Leif Ryd and the team at the world famous Karolinska Institute in Sweden. Following extensive animal studies, the implant was then tested in humans, and in 2017 clinical results were published, showing excellent outcomes. The clinical indications for the use of the Episealer implant are very specific, and a thorough assessment of the knee has to be made first, as not all cartilage defects are suitable for this kind of surgery. If it looks like your knee might be suitable for an Episealer, then you will be sent for a special high-res planning MRI scan. The scan data is sent to the design team in Sweden, and they will then provide a report stating whether or not the cartilage defect is suitable. 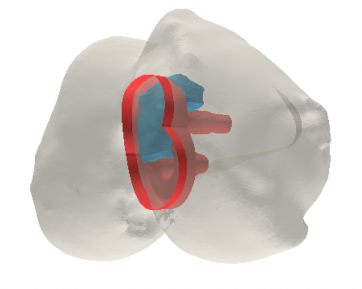 If it is, then the team will design an implant to match the size, shape and contours of the cartilage defect, and then a custom-made prosthesis will be designed and manufactured, specifically to fit. This process takes approximately 6 weeks. The surgery itself is normally undertaken under a general anaesthetic, with a 1- or 2-night stay in hospital. Patients are mobilised fully-weight-bearing straight away, but with the assistance of crutches for the first week or two, as required. We advise patients to take things easy for the first 10 days or so, before then getting stuck into a course of post-op physio rehab treatments. 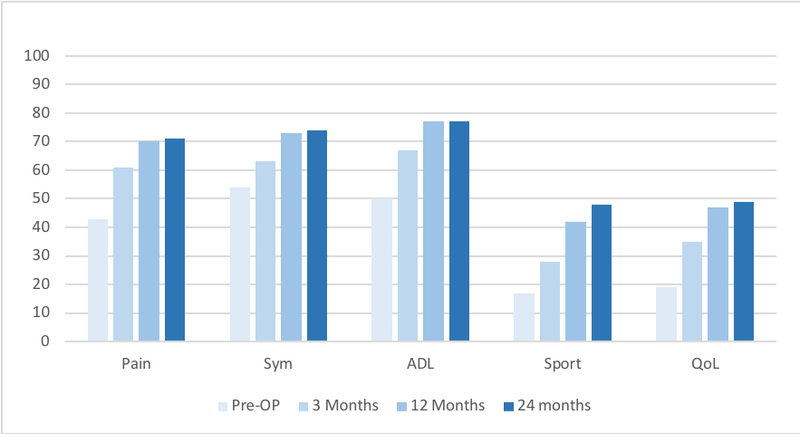 There is a fairly rapid recovery in the early post-op period, over the course of the first 3 months; however, there is then a more gradual continuation of improvement out to 12 months post-op, where the outcomes then remain steady, with no decline seen by 24-month follow-up. 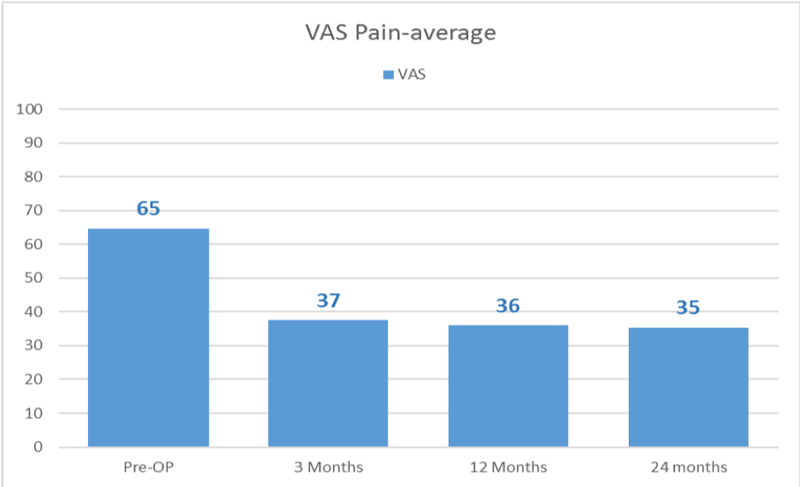 To-date, over 350 Episealers have been implanted world-wide, and the data from the latest clinical study, reporting the outcomes of 99 patients with up to 24-month follow-up shows significant improvements in knee scopes and significant decreases in knee pain. To find out whether you might potentially be suitable for an Episealer implant, you will need a full and detailed assessment of your knee – CLICK HERE for further information on how to book an assessment. CLICK HERE for further information from the Episurf website.